At the tender age of eight, she decided to become a vegetarian for life. Serene-faced and compassionate, she is now a mother of 5, grandmother of 12, and great-grandmother of 10, and enjoys interacting across generations. Bhagwanthiji Nagpal (79), a Sindhi residing in Chennai, is the eldest daughter as well as eldest daughter-in-law. Needless to say, adjusting and understanding is a way of life. The notion of me and mine does not exist in her framework. As she says, when one grows up with many people, it is but natural to think of the well-being of the family before taking any decision. Namaste Bhagwanthiji, tell us about your beginnings. I was born in Quetta, Balochistan where I lived until I was 14 years old. After that, we moved to Udaipur during the Partition of India in 1949. Oh yes, one cannot forget that. Our house as well as shop was burnt. We left everything and simply moved trusting in God and His ways. And you also got married that same year? Was it already fixed? No. My father-in-law lived in Kandahar (Kabul) earlier but he had also moved to Udaipur at the same time. He saw me at some gathering and felt that I would be ideal for his son. He then approached my father and urged until my father agreed. I got married in June 1949 when I was just 14 years old. Do both families still live in Udaipur? No, my parents later shifted to Indore while my father-in-law came to Chennai and settled here with his family. I have spent most of my life in Chennai. How did you cope and adjust in your new family since you were quite young? The family must have also faced the challenge of coping with a new place and new livelihood! Govind Nagpal (son): My elders were traders of dry fruits. My father often spoke about the gardens of fresh fruits in Kandahar and trading in fresh as well as dry fruits. They had to give up everything and start afresh in India. Bhagwanthi: But at home, things were relatively smooth. The menfolk ensured that we had a good life. There were cooks and domestic staff at home. Even my mother-in-law hardly cooked. How then did you become such a good cook? It was when we moved to a nuclear family that I learnt cooking from my husband (laughs). He was an expert in the kitchen and was very particular about the perfect quality of food for every meal. Hence I had to serve him good food and over time, it just became a passion for me. We enjoyed being hospitable and welcomed our friends and relatives who always enjoyed eating at our house. Your sons tell me that you are a pure vegetarian. How did that happen since you were brought up as well as married into a non-vegetarian family? I think I was around eight years old when I saw my mother chopping mutton. I was repulsed by the blood and gore. Since then, I have been eating only vegetarian food. My parents and later my husband insisted many a times that I start eating non-vegetarian food again, but I remained firm. This is truly amazing! It makes one believe in samskaras from past life. Anjali Nagpal (daughter-in-law): And what is even more admirable is that she cooked non-vegetarian food for her husband and also for her children. She has always been easygoing about that. She may not eat non-vegetarian food, but she cares enough to cook for them. Bhagwanthi: Oh I think it is important to perform one’s duties with joy, whatever one’s personal preferences may be. I will attribute it to the simple way of thinking with which we grew up. Earlier, there were no strong personal likes or preferences. It was mostly shared thinking. We did not think of personal freedom. But all that has changed now? Do you miss that way of life now? We have to accept change and move on. Another example would be intercaste marriages which are so common now. But when I was growing up, marriages took place within one’s own community – they were the people who were considered as one’s own. Do you state your preference to the youngsters in the family? Not at all. It is each one’s life and there is no point in being interfering or critical. As far as my grandchildren are concerned, I do not interfere with how their parents want to bring them up. But I do believe that it is important for any couple to have two children at least. What do you expect from your family? I am very fortunate to have sons and daughters-in-law who care for me very deeply. They indulge me and keep me happy. I have been unwell this month and hence cannot move about easily, but my daily routine includes yoga, walking, satsang and praying. I also enjoy supervising the kitchen and housework. 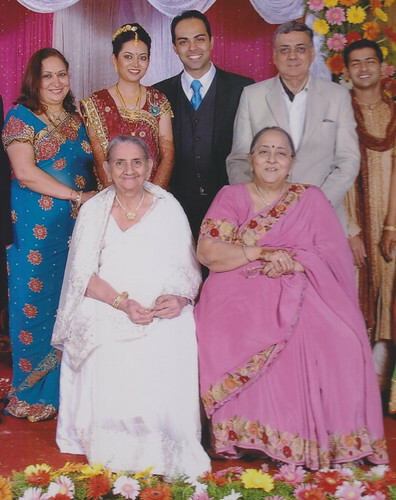 Shankar Nagpal (son): She has always been quite independent and manages herself quite easily. She also enjoys meeting people and is a good hostess. Which are some of your favourite Sindhi preparations? I think the important thing is the combination. For instance, Sindhi kadhi with steamed rice, sweet boondi and took which is a fried savoury is a delicacy. Our family also enjoys Aate ki choori (mixture of roti bits with sugar and ghee) with rice and the famous Sai bhaji with fresh vegetables which is popular as a weekend dish when you want to use up all the vegatables before buying afresh. Sai bhaji also tastes delicious with koki which is a thick roti made with chopped onions. How rightly you have spoken of food combinations being more important than single recipes. But for now, we would love to learn the recipe of Sindhi Kadhi from you. First published in March 2014 in Harmony – the Indian Magazine for silvers for the column – SoulFood & SoulMates. Part-2 of this post is Sindhi Kadhi, a traditional dish cooked in tomato gravy from the kitchen of Bhagwanthi Nagpal. She is the 19th grandma featured in this column. I too am a vegetarian by choice – of course I did not become one at a young age of 8. Also, My reasons for feeling strongly about the vegetarian way of life has nothing to do with religion, ethics, animal rights and all other similar moralistic ideas. I believe that Vegetarianism is the only way in which we will be able to protect the environment and ultimately the human race. Appreciate what you say Sanjeev. For each one of us, reasons are different. I agree with what you say, but for me, within me, vegetarianism is deeply linked to ahimsa. Thanks for reading this. Nothing can beat Sindhi food. Sindhis like to cook and eat royally. Nothing can beat the Sindhi brain. We do not have a State or land of our own, yet we have conquered the world. Jai Jhule Lal Sai Ki.